"The History of the Eagles" will be shown in two parts on Showtime Feb. 15-16. Frey said the band might eventually make new music together. Their last album together was 2007's "Long Road Out of Eden." The Eagles picked the producer of their new Showtime documentary "The History of the Eagles" — but they insist that's about all the control they had in the making of it. "It's really not a film that represents our point of view so much," Glen Frey said Saturday as the quartet spoke at the Sundance Film Festival hours before the film's premiere. The film was directed by Alison Ellwood and produced by Alex Gibney, whose other documentaries include the Academy Award-winning "Taxi to the Dark Side" and "Enron: The Smartest Guys in the Room." 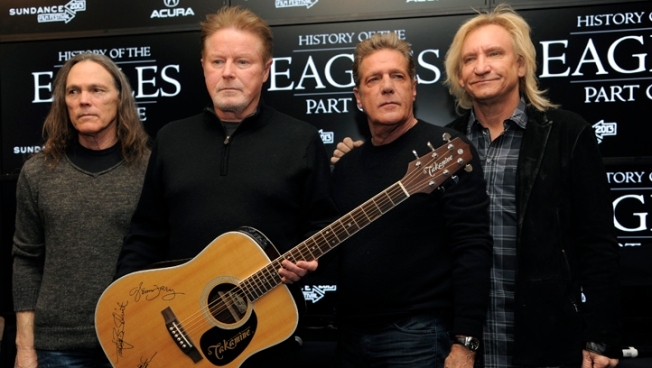 "The History of the Eagles" will be shown in two parts on Showtime Feb. 15-16. It includes 40-year-old footage that was in the band's archives, as well as recent interviews with the band. Henley said he was interested in someone making a documentary about the Rock and Roll Hall of Famers but was unimpressed with recent music documentaries. So, he asked to see the work of Oscar-winning documentary filmmakers and was led to Gibney. From there, he worked to convince Gibney that he should tell the band's story, and they had "zero" influence on its outcome. "We have a good story to tell and I think he's a great storyteller," Frey said, adding that Gibney told him, "We're going to make a movie, and we're going to tell the truth." Don Henley said the band hasn't even seen the final cut yet. "I hope we like it," he joked. Frey said what surprised him most about the film, and seeing the old footage, was "how much fun we had." That may surprise people who are familiar with the band's well-documented discord, including their acrimonious breakup in 1982 (they got back together in 1994). "Most of the things that have been written about this band have focused on conflict — the journalism of conflict," Henley said. "It sells papers and magazines, but one thing that Glen said that people will see in this documentary is that we had a lot of fun. Some of it's not on film, and that's good." "The bitter fighting that the media loved to talk about really didn't take place. We argued a lot, we discussed stuff a lot, and that tension had a lot of to do with the creative process," Walsh said. "We didn't hate each other; we didn't have fist fights, none of that." Walsh, Henley, Frey and Timothy Schmit were expected to attend the premiere later Saturday. "I think what we realized is how good we are together and how things have changed, and it would be a shame if we didn't try to find a way to create some more new music," Frey said. "People really like to hear us sing, we really do well, we still perform at a very high level, so for me, it would be great."